Follow Me.The Time I Almost Died (and the Church Saved Me) - Follow Me. This statement reminds me of something else I saw in the news recently: As the flood waters receded from the devastating torrents in Colorado, a hopeful news piece focused on St. Malo’s retreat center just outside Estes Park. After a mudslide on nearby Mt. Meeker, passersby noticed that two things went undestroyed: The chapel built on a rock, and the John Paul II trailhead where our previous, saintly pope once walked. I was familiar with these because I had been there, and I almost lost my life on Mt. Meeker on a high school youth group trip. Caught in a lightning storm with no protection, we were forced to crawl down the very side of the mountain that was later washed away in the mudslide. 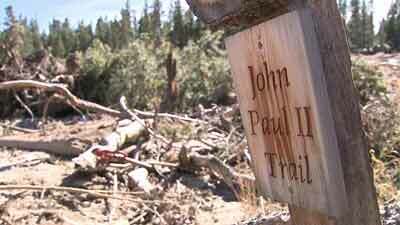 After an arduous descent, soaking wet and shivering, we eventually sorted through the many false trails and found the true trail that led us to safety: The John Paul II trail. My heart leapt when I saw the trailhead. The Church is in the middle of a cultural mudslide that is claiming victims. The culture of death and relativism, which was supposed to bring freedom, has wrought destruction: abortion, broken homes, addictions, and a legion of other consequences. The commandments are the true trail that leads to shelter on the unfaltering rock of the Church. It is not a cold rock, nor a forced march down a rigid path. The Church is an encounter with the warmth of mercy, and she unabashedly delves into the muck of people’s lives – of our sins and their consequences – to seek and find the lost. The “rules” of the Church are guideposts, not shackles. They lead us home to shelter, safety, and freedom. The “smaller” rules eventually make sense in light of the larger ones, and the larger ones in light of the one great truth: “Jesus Christ has saved you.” I experienced God’s justice in that lightning storm – in the face of death, I was starkly aware of my sinfulness. But I experienced mercy through that trail that led me home. So God’s mercy triumphs over his justice if we follow the trail back to him, into the warm shelter of the Church and of salvation.